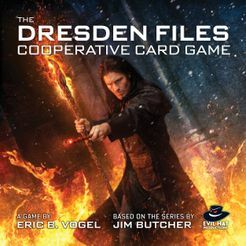 In The Dresden Files Cooperative Card Game, players work together to solve cases from the bestselling Dresden Files novels in the ultimate what-if scenario: What if Harry was on the scene with allies who weren’t there in the original story? Play Harry, Murphy, Susan, Michael, and the Alphas in the first five novels, or take on “Side Jobs” in a random scenario generator based on the short story collection of the same name. The game has plenty of in-jokes and references for Dresden fans (like the unreliable range of the Blue Beetle), but it’s accessible to people who haven’t read the books. This is a tightly tuned, strategic, cooperative game that feels intense, vital, and a little bit risky (thanks to dice and other factors) throughout play. At 30 minutes per session, gameplay is fast-paced and down to the wire. In this game, players take on the role of Harry Dresden and his allies, investigating cases and taking on foes from the books. To accomplish this, you’ll share a common pool of action points (called Fate points), and each player must choose between taking an action or generating Fate points each turn. Solve more cases than there are foes left standing to win! In short, each player plays a character from the novels (one of them is always Harry), taking on a shuffled scenario deck based on one of the books in the series. Using a combination of cards, dice, and teamwork, players attack foes, investigate cases, take advantages, and overcome obstacles to make sure they have the best possible odds for a win in the final showdown at the end of the book! Like any good cooperative game, it’s hard to win (no fun if there’s no challenge! ), but always rewarding to play, and scales smoothly from one to five players.